You will need 14 (18) balls of Patons "Cotton DK" color #3690 turquoise, sizes E and F crochet hooks for size 10-12, sizes F and G crochet hooks for size 14-16. 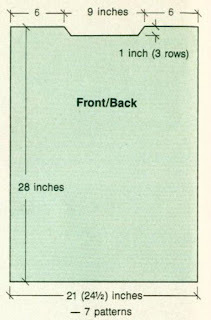 BACK: With size E (F) hook, ch 129. Foundation Row: Dc in 5th ch from hook, *ch 2, sk 2 ch, dc in next ch; repeat from * across, dc in last ch. Ch 4, turn. Row 1: (Right Side) 3 Dc in first ch-2 sp, *ch 3, sk next ch-2 sp, 3 dc in next ch-2, repeat from * across, end ch 1, dc in top of turn ch of last row. Ch 3, turn. Row 2: Dc in ch-1 sp, *ch 3, 3 dc in ch-3 sp, ch 5, 3 dc in next ch-3 sp, ch 3, 3 dc in ch-3 sp; repeat from * across, end last repeat 1 dc in turning ch, 1 dc in 3rd st of turning ch. Ch 1, turn. Row 3: Sc in first dc, ch 1, sc in ch-3 sp, *ch 3, 3 dc. ch 5, 3 dc in ch-5 sp, (ch 3, sc in next ch-3 sp) twice; repeat from * across, end ch 3, 3 dc, ch 5, 3 dc in ch-5 sp, ch 3, sc in ch-3 sp, ch 1, sc in top of turning ch. Ch 1, turn. Row 4: Sc in first sc, sc in ch-1 sp, *ch 2, dc in next 3 dc, 3 dc, ch 3, 3 dc in ch-5 sp, dc in next 3 dc, ch 2, sk next ch-3 sp, 3 sc in next ch-3 sp; repeat from * across, end last repeat sc in ch-1 sp, sc in last sc. Ch 1, turn. Row 5: Sc in first sc, *ch 2, dc in next 6 dc, 6 dc in ch-3 sp, dc in next 6 dc, ch 2, sc in center sc; repeat from * across, end last repeat sc in last sc. Ch 4, turn. Row 6: *Dc in first dc of shell, (ch 1, sk 1 dc, dc in next dc) 4 times, ch 2, dc in next dc, repeat between ()'s 4 times: Repeat from * across, tr (yo hook twice) in sc. Ch 1, turn. Row 7: Sc in tr, *sc in ch-1 sp, (2 sc in next ch-1 sp) 3 times, 3 sc in ch-2 sp, repeat between ()'s 3 times, sc in ch-1 sp, sc between next 2 dc; repeat from * across, end last repeat sc in top of turning ch. Ch 5, turn. Row 8: Sk 1 sc, *dtr (yo hook 3 times) in next sc, ch 2, sk 2 sc, tr (yo hook twice), ch 2, sk 2, dc in next sc, ch 2, sk 1 sc, dc in next sc, ch 2, sk 2, tr in next sc, ch 2, sk 2, dtr in next sc, ch 2, sk 3; repeat from * across, end last repeat, omit ch 2, sk 1 sc, dtr in last sc. Ch 3, turn. Row 9: Dc in first dtr, *ch 3, sk ch-2 sp. 3 dc in next ch-2 sp; repeat from * across, end ch 3, 2 dc in top st of turning ch. Ch 6, turn. Row 10: 3 Dc in first ch-3 sp, (ch 3, 3 dc in next ch-3 sp) twice, *ch 5, 3 dc in ch-3 sp, (ch 3, 3 dc in next ch-3 sp)twice; repeat from * across, ch 2, dc in top of turning ch. Ch 6, turn. Row 11: 3 Dc in ch-2 sp, (ch 3, sc in next ch-3 sp) twice, ch 3, *3 dc, ch 5, 3 dc in ch-5 sp, repeat between ()'s twice, ch 3; repeat from * across, end 3 dc in turning ch. ch 2, tr in 4th st of turning ch. Ch 4, turn. Row 12: 3 Dc in ch-2 sp, dc in next 3 dc, ch 2, sk next ch-3 sp, 3 sc in next ch-3 sp, ch 2, *dc in next 3 dc, 3 dc, ch 3, 3 dc in ch-5 sp, dc in next 3 dc, ch 2, sk next ch-3 sp, 3 sc in next ch-3 sp, ch 2; repeat from * across, end 3 dc in next 3 dc, 3 dc in turning ch, ch 1, dc in 4th st of turning ch. Ch 3, turn. Row 13: Dc in first dc, dc in ch-1 sp, dc in next 6 dc, ch 2, sc in center of 3-sc group, ch 2, *dc in next 6 dc, 6 dc in ch-3 sp, dc in next 6 dc, ch 2, sc in center of 3-sc group, ch 2; repeat from * across, end dc in next 6 dc, 3 dc in turning ch. Ch 4, turn. Row 14: Dc in first dc, (ch 1, sk 1, dc in next dc) 4 times, *dc in next dc. repeat between ()'s 4 times, ch 2, dc in next dc, repeat between ()'s 4 times; repeat from * across, end dc in next dc, repeat between ()'s 4 times, ch 1, dc in top of turning ch. Ch 1, turn. Row 15: Sc in first dc, sc in ch-1 sp, (2 sc in next ch-1 sp) 3 times, sc in ch-1 sp, sc between next 2 dc, *sc in next ch-1 sp, repeat between ()'s 3 times, 3 sc in ch-2 sp, repeat between ()'s 3 times, sc in ch-1 sp, sc between next 2 dc; repeat from * across, end sc in next ch-1 sp, repeat between ()'s 3 times, 2 sc in top st of turning ch. Ch 3, turn. Row 16: Sk 1 sc, *dc in next sc, ch 2, sk 2 sc, tr in next sc, ch 2, sk 2 sc, dtr in next sc, ch 2, 3 sc, dtr in next sc, ch 2, sk 2 sc, tr in next sc, ch 2, sk 2 sc, dc in next sc, ch 2; repeat from * across, end last repeat omit ch 2, dc in last sc. Ch 4, turn. 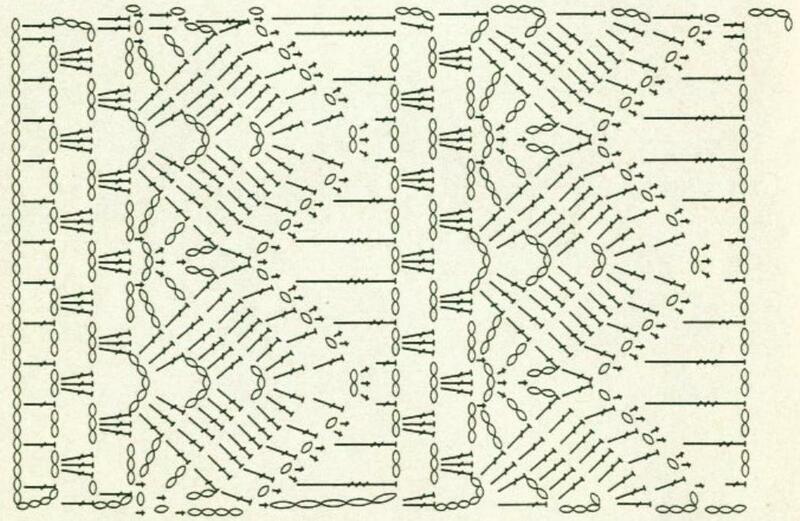 Repeat these 16 rows for pattern. Work even until 64 rows — 4 patterns (48 rows — 3-1/2 patterns) have been completed — about 28 inches from beginning. 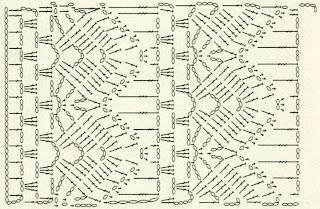 End with pattern Row 16. Row 1: 3 dc in first ch-2 sp, *ch 3, sk ch-2 sp, 3 dc in next ch-2 sp; repeat from * 4 (5) times, ch 1, sk ch-2 sp, dc in next dc. Ch 3, turn. Row 2: Dc in ch-1 sp, ch 3, *3 dc in ch-3 sp, ch 3; repeat from * 4 (5) times, 2 dc in turning ch. Ch 4, turn. Row 3: * 3 Dc in ch-3 sp, dc in next 3 dc; repeat from * 4 (5) times, 3 dc in ch-3 sp, dc in turning ch. Row 1: From right side of work, sk 17 (13) ch-2 sp for neck, join yarn in next dc. Ch 4, *sk ch-2 sp, 3 dc in next sp, ch 3; repeat from * 4 (5) times, sk ch-2 sp, 3 dc in next sp, ch 1, dc in turning ch. Ch 3, turn. Row 2: Dc in ch-1 sp, *ch 3, 3 dc in ch-3 sp; repeat from * 4 (5) times, dc in turning ch, dc in top st of turning ch. Ch 3, turn. Row 3: Dc in first 4 dc, * 3 dc in ch-3 sp, dc in next 3 dc; repeat from * 3 (4) times, 3 dc in last sp, dc in last dc and in top of turning ch. 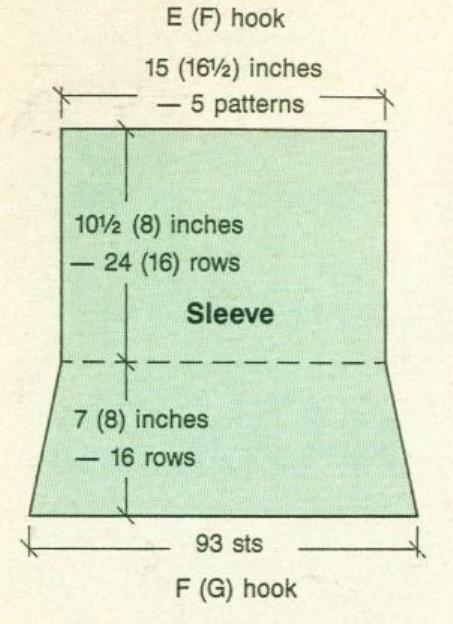 SLEEVES: With size F (G) hook, ch 93. Work as for back for foundation plus 16 rows. Change to size E (F) hook, work even for 24 (16) more rows, about 18 inches from beginning. Fasten off. 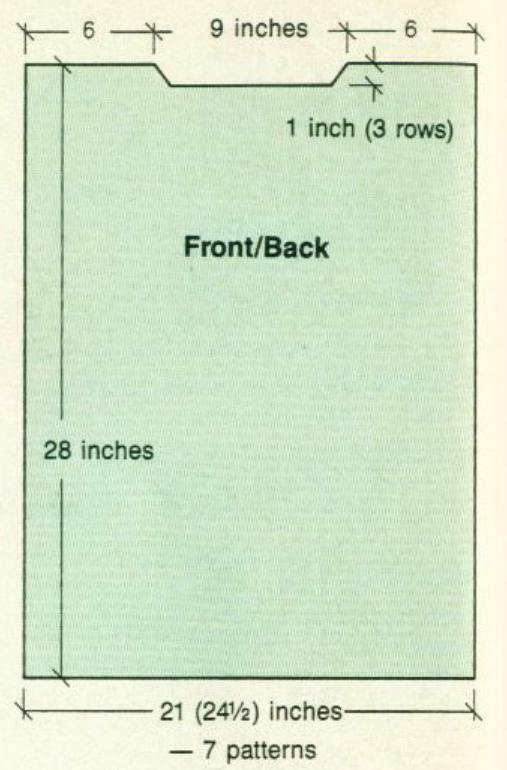 Finishing: Block pieces to measurements according to charts. 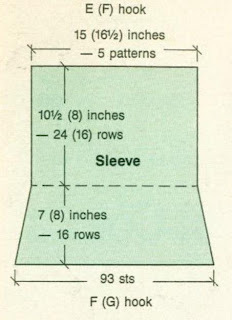 Sew underarm, sleeve and shoulder seams. Work 2 rows sc around neck edge. Trim on Sleeves and Lower Edge of Tunic: Join yarn at seam. With size E (F) hook, sc in next 2 dc, ch 3, sc in same dc, *1 sc in ch-2 sp, sc in dc, ch 3, sc in same dc; repeat from * around, sc in last dc. Lightly steam seams and trimmed edges.